Your mother in law just called and she’s on her way. It’s going to take her two hours to drive to your house. WHAT DO YOU DO? Well, according to popular opinion, moving is one option. Locking the door and turning out the lights is another option. Or you could engage in an epic bout of decluttering that will make even her proud to call you ‘family’. There are certain items which are definitive cluttering culprits. Deal with those first to make a dent in the piles and the overall visual impression will be much improved. These are sorted per room, so that you can go from one to the next, quickly and easily. CDs and DVDs — keep your favourites while you go through the piles and streamline. 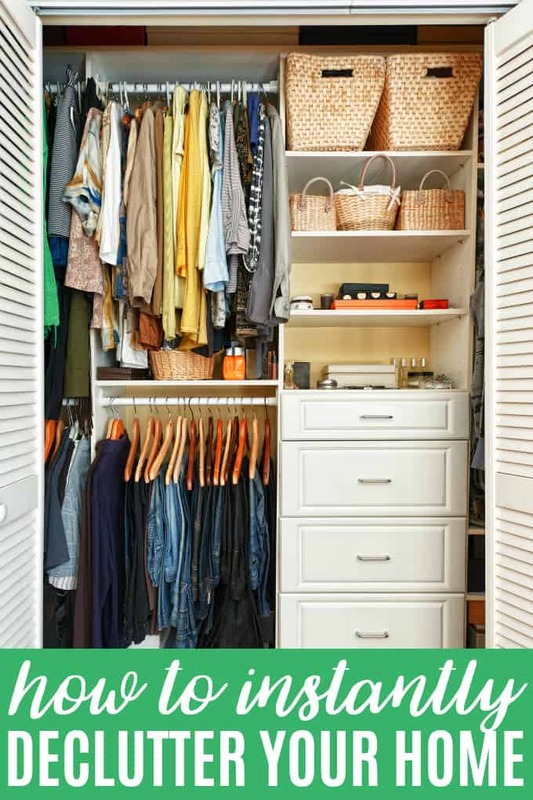 If you can get it down to a manageable number, you might be able to free up some shelf space for other things. Make a note to spend some time at a later date transferring your favourite CD music to your MP3 player. Magazines — these seem to pile up and reproduce on their own. Go through, keep this year’s or an issue that is of particular interest, clip recipes or articles that you want to scan and keep and the rest needs to go to the recycling bin. Take out bits and bobs — every time your order food in, it comes with a menu, plastic cutlery, packets of ketchup or soy sauce and chopsticks. Unless you use those items regularly, or like picnicking with sushi, throw them out! Dried out pens and broken things in the junk drawer — having a catch all junk drawer isn’t a great way to stay on top of the clutter but if you ARE going to have one, divest it of things that don’t actually work! The spice rack — this is one area where we tend to buy more, not realizing we already had some at home! Go through it and check. Some spices do have a shelf life limit, so you might want to sniff test them too! Anything stuck to the fridge — nothing adds to the visual clutter more than a crazy fridge door! Keep the essentials but lose the pictures from two years ago and the thousand magnets you’ve thrown up there! Expired paperwork — old receipts, ancient take out menus, coupons from 2010… All the bits of paper floating around your kitchen and dining room that you don’t need anymore: recycle what you can and throw out the rest! Old perfume / soap bottles / body lotions — basically anything that is scented and in your bathroom needs a look. If no one has touched it in a year, it’s time for it to go. First aid supplies — a lot of these can expire too, so check carefully and assemble a bin or basket for your first aid supplies so that they’re tidy and you can find them when you most desperately need them. More expired paperwork — beyond the coupons and menus in the kitchen, the home office is the next likely place to find paperwork piled up that needs a home. If you don’t have the time to file it / scan it right there and then, get a box and label it ‘to be filed’ then put a note in your calendar and get it done! Half filled notebooks — you buy a notebook, use it for a while, set it aside, can’t find it, so you buy another one. Pretty soon, your desk looks like you could open your own notebook store. Review each, pull any pages worth keeping and the notebooks that still have 90% of their pages left. The rest? Recycle. Old electronics — how much do you want to bet that you have an old flip phone somewhere in your house? Get rid of old, obsolete electronics. Holding on to them isn’t doing anyone any favours. Old or broken jewelry — odds are, you’re cluttering up that space with earrings that have a missing mate, broken pieces, old pieces that you’ll never wear again. Streamline and keep it to things you wear regularly. (TIP: hanging necklaces and earrings on tiny hooks within a frame can be a gorgeous way to keep them untangled and out of the way) Any other pieces that you want to keep for sentimental reasons should be stored away. Old clothes, shoes and accessories — nothing says dingy than piles of damaged, old clothes. If you haven’t worn something in the last twelve months, you probably aren’t going to. Worse still if you keep pieces that are stained and damaged beyond repair ‘just in case’. No. If they’re damaged and can’t be donated, dump them! That old vinyl purse with the broken strap is never coming back to life! Paint cans — you’ve got three cans of paint left from your kitchen remodel six years ago, each with just a bit of paint left. Instead of keeping all of that, take pictures of the can and the colour code so you can reproduce it if you need to but get rid of the dried out cans. Same goes for old paint brushes that are still crusty, and any other painting paraphernalia that hasn’t been properly cleaned. Boxes from your last move — this is not unusual. You move and you never open certain boxes because they contain doo dads and things that you don’t really need. But you’re afraid to throw them out in case you decide you do need them after all. You can’t deal with this quickly, so make a note in your calendar, pick a day and go through them. There… don’t you feel better? Clearing out clutter does more than make your mother in law happy. It will make you happier too. Do you have any problem clutter areas in your home? You might also like these organization apps or how to organize user manuals. Now I want immediately to declutter our home 🙂 Thanks a lot for your fantastic tips! How do you streamline music? I’ve heard of this. We don’t have fast internet. Our family just purchased a CD cabinet today for our 240+ CD’s. I am the only one who has an IPOD. Only use it to exercise with at the gym or in the summer when I go walking. Any suggestions are welcome. What I do is download the music I like from Apple Music (or you could use a service like Spotify) and then I can donate the old CDs to free up some shelf space.